The 2018 edition of the Radio Times Guide To Films was published last month. Radio Times is the most recent of the annual film guides (first published in 2000), though it has outlasted all of its older competitors: Leonard Maltin's Movie Guide ceased publication in 2014, the Time Out Film Guide ended in 2012, Halliwell's Film Guide came to an ignominious end in 2008 as The Movies That Matter, and The Virgin Film Guide finished in 2005. That leaves the Radio Times as the last film guide standing, as the only comparable guide, VideoHound's Golden Movie Retriever, is restricted to films released on video. New entries include Alien: Covenant ("no particularly new ground is broken"), Wonder Woman ("as heartfelt as it is thrilling"), Guardians of the Galaxy II ("funny, imaginative and surprisingly soulful"), John Wick II ("just as enjoyable as the original"), and Valerian and the City of a Thousand Planets ("a sometimes silly space opera of the most bizarre yet exhilarating kind"). There are a couple of questionable star ratings: Baby Driver gets only two stars for its "disjointed plot", while Doctor Strange is apparently a five-star "visually dazzling fantasy". Dunkirk ("a glorious, breathtaking triumph") and Moonlight ("a film of rare empathy and shimmering beauty") are much more deserving of their five stars. 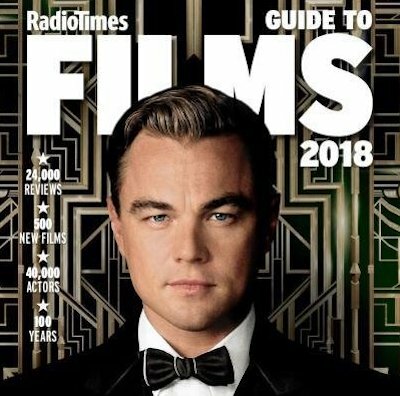 The Radio Times Guide to Films 2018 has had what editor Sue Robinson describes as "a judicious redesign," with a five-column layout on wider pages, replacing the previous four-column format. This has made space for 622 more film reviews, making an impressive total of 24,661 entries, a significant increase over last year. (In contrast, the number of reviews in VideoHound decreases each year.) Previews of forthcoming films are still included, accounting for at least 150 of this year's 542 new entries. The book is impressively up-to-date, with reviews of Oscar contenders such as The Shape of Water; Three Billboards Outside Ebbing, Missouri; and Darkest Hour before their UK releases. In a departure from recent editions, the cover now features a contemporary movie still: a publicity shot of Leonardo DiCaprio in The Great Gatsby. (The 2017, 2016, 2015, 2014, and 2013 editions all had classic films or stars on their covers.) Also, the Barry Norman quote on the cover of previous editions has now been removed, following his death this year. (Similarly, the blurb by the late Roger Ebert has now been removed from 1001 Movies You Must See Before You Die.) People with only two entries have now been removed from the actor and director indexes, and DVD/blu-ray availability is no longer indicated.